You'll be amazed at how easy it is to manage your own content. Put in or take out new products, change pictures, prices, add customer reviews, anything you want, all from an easy-to-use content screen that you log into from your home or business computer. MightyMerchant has a simple interface for moving your product data in and out of our system. Customers use this when updating large quantities of items or doing regular inventory updates. 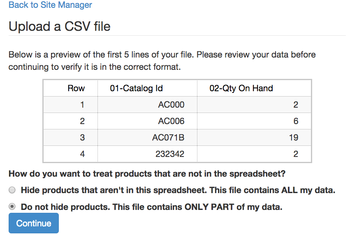 MightyMerchant also offers custom import scripts for automatically connecting to third party data sources and downloading product data. 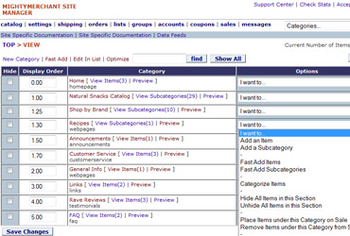 Update your site quickly using features such as Fast Add, Categorize Products and Edit in List. These features put the information you need to change on one page, so you can make the changes and save without having to clicking through page after page of management screens.